'Benbo' ball and socket tripod head by Kennett Engineering Co. Ltd. Still available from Paterson Photographic. I have had this 28mm ball and socket tripod head since the 1990s and use it regularly. Recently, it became tricky to use because the top plastic bearing (which the ball presses against when it is locked) had come loose. As well as causing a lot of friction, it prevented the head from swiveling the camera 90˚ to portrait format. The base is bolted-on with a size of allen bolt I don't have the key for, 3.5mm or something close - this meant I couldn't take it apart to fix it. Coincidental with the plastic bearing surface coming adrift was the appearance of gunky looking crud which I assumed was the old glue. 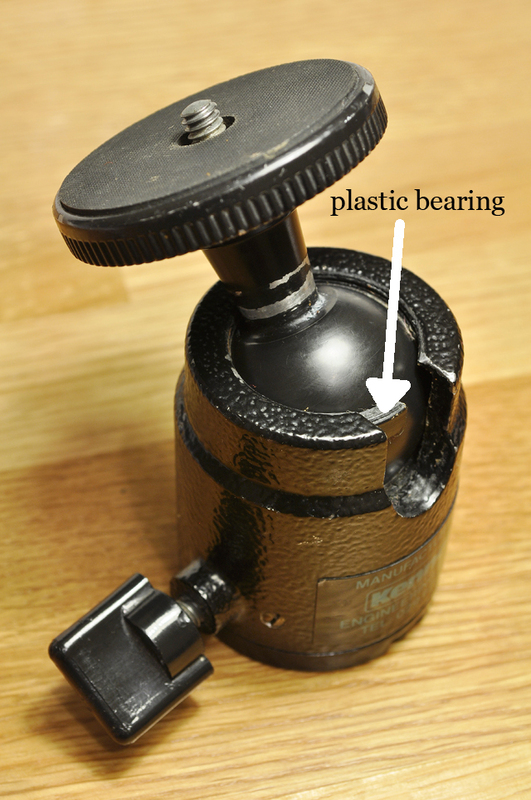 Remove any crud, congealed grease and errant glue from both the ball and the top (arrowed above) surface of the plastic bearing. Feed the plastic ring around so the top surface is visible and apply a drop of SuperGlue. Quickly, feed it round some more and apply another drop, and so on. Align the ends of the bearing with the mouth of the body - quick! Tighten the lock screw to apply pressure to the glued joint. It was easy to avoid getting glue anywhere but the top surface of the bearing. Works fine now. It's good you could repair your tripod head. They can be expensive. Well, I have a pair of these shared between two tripods and a monopod. And yes, they don't come cheap. Pretty obvious fix, really.But you know how it is. Sometimes, you jut get some reassurance from seeing how it might be tackled.